I did not score well in the first attempt but in the second attempt, i scored good in ASQ CSSYB exam. Thanks to processexam practice tests. They are awesome and grilled me, making me realize the tough competition in ASQ Six Sigma Yellow Belt (CSSYB) certification exam. Generally, we forget the results after every ASQ CSSYB mock test. But questions here help analyse the results with personalized result history. It helped me track progress. 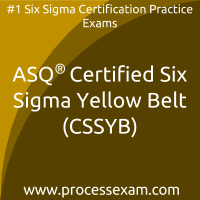 I scored good in ASQ Six Sigma Yellow Belt.